IPA has been retained as Project Manager to secure entitlements and oversee the redevelopment of approximately 3.9 acres into a new market-rate residential and commercial mixed-use development in East Oakland. This role requires selection and oversight of project architect, engineers and other consultants, and liaison and coordination with several City agencies. Ineda Adesanya served as Project Planner/Manager for this highly controversial mixed-use, multi-family residential and commercial development adjacent to a BART station. The project involved extensive community outreach, coordination and consensus building. Thomas Berkley Square is a mixed use commercial office and residential condominium project located on Thomas L. Berkley Way (20th Street) and San Pablo Avenue, on over 1.5 acres of land in Downtown Oakland. It is a 242,000 sqft mixed use development being developed in three phases. 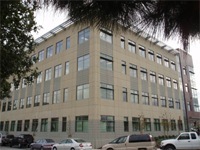 The first phase, the North County Self Sufficiency - Social Services facility is located on 2000 San Pablo Avenue and consists of a 4 story, 110,000 sqft office building that was completed in January 2006. Phase II is a 96-unit mixed use residential and condominium project along with 4000 sqft of ground level retail adjacent to phase I, located on 630 Thomas L. Berkley Way, Oakland, CA. The third phase will be a 9,000 sqft entertainment hub with a tentative completion date in mid 2006. For this prominent transit-oriented development, IPA provided property management solicitation and procurement services in Phase I. For Phase II, IPA's services included serving as primary liaison with the City of Oakland in the management and oversight of all activities associated with acquisition of entitlements for Phase II of the Thomas Berkeley Square development (aka. TBS Housing). The scope of services specifically included: Formal representation of owner in the acquisition of all remaining entitlements including approvals and filing of the Tentative and Final Tract Maps and the Condominium Plan. This service included liaison with the City and all other required agencies, as well as necessary coordination with the DRE Processor and real estate attorney preparing the CC&R’s and related documents to be submitted to the DRE. IPA also managed the relationships between all consultants, engineers, contractors and government officials needed to secure the entitlements, including assistance with cost and schedule management to ensure that the all applicable maps, plans and documents were processed, executed and/or approved on-time and within the agreed upon budget.